My latest book is THE PEAK. An illustrated history of Hong Kong’s top district. It documents how it was developed from a barren hillside into the exclusive residential area it is today. 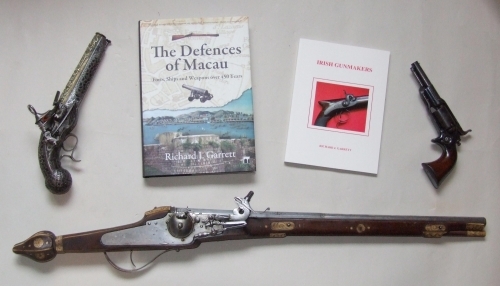 My book THE DEFENCES OF MACAU relates Macau's history as it affected the measures taken to defend the territory from attack by at first other European states and later by potentially aggressive Chinese Forces. Much remains to remind us of the Forts and weapons that made up the defensive systems that evolved over the years. My first book IRISH GUNMAKERS is a listing of gunmakers and gunsmiths working in Ireland from the early seventeenth century to the nineteenth century. Makers are listed alphabetically and also by location. The first chapter gives a brief history of Ireland's troubled past and its gun trade. also details Proof Marks and Police Registration Marks.